Dr. Tuan Anh Le received his B.Eng. and M.Sc. degrees both in electronics and telecommunications from Hanoi University of Technology, Hanoi, Vietnam, in 2002 and 2004, respectively, and his Ph.D. degree in telecommunications research from King's College London, The University of London, UK, in 2012. He was the recipient of the prestigious Ph.D. scholarship jointly awarded by the Virtual Center of Excellence in Mobile & Personal Communications (Mobile VCE) and the UK Government's Engineering & Physical Sciences Research Council (EPSRC). From August 2004 to May 2006, he was a Telecommunications Specialist working for the Planning and Project Management Division, Department of Financial Informatics and Statistics, Ministry of Finance, Hanoi, Vietnam. He participated and contributed to several IT and telecommunications projects. In 2005, he was awarded the Excellent Staff Prize by the Minister of the Ministry of Finance Vietnam. From April 2009 to March 2012, he was a researcher on Green Radio project funded by the Core 5 joint research program of the UK's EPSRC and the Mobile VCE. He participated in work package GR-2.3, i.e., Power Efficient Digital Signal Processing where the focal was on signal processing algorithms to minimize radio-frequency-transmission power and co-channel interference. During this time, he proposed developed several coordinated-multipoint-transmission (CoMP) algorithms and backhaul protocols to tackle inter-cell interference so that the total transmit power of the network is significantly reduced. From July 2013 to October 2014, he was a Post-Doctoral Research Fellow within the School of Electronic and Electrical Engineering, University of Leeds, Leeds, UK. His tasks were to design and develop novel radio resource allocation algorithms, with low computational complexity and signaling overhead, for spectrum sharing, i.e., cognitive radio, systems with uncertain channel information and spectrum sensing. Since November 2014, he has been with the Faculty of Science and Technology, Middlesex University, London, UK. He is currently a senior lecturer. My research interest focuses on developing resource allocation strategies and algorithms satisfying the mixture of users' demands (i.e., high data rate for mobile devices, strict real-time connections for enormously large number of connections for internet-of-thing devices) with energy efficiency, spectral efficiency and security. The tools for solving such challenging problems are convex optimisation, multi-objective optimisation and artificial intelligence. Hayder Al-Salihi (PhD thesis at King's College London, 2015-March 2018) (Co-suppervisor with Dr Mohammad Reza Nakhai) - Research topic: "Pilot Contamination Mitigation for Massive MIMO System using Novel Channel Estimation Techniques". Adeola Abraham Omorinoye (PhD thesis at Middlesex University, 2017 - ) (Co-suppervisor with Dr Quoc-Tuan Vien) - Research topic: "Energy and spectrum efficiency for dense small cell networks". I am looking for highly motivated students with strong mathematics and telecommunications backgrounds. Please contact me at t(dot)le(at)mdx(dot)ac(dot)uk for details. [BC1] M. R. Nakhai, T. A. Le, A. M. Akhtar, and O. Holland, “Chapter 11: Cooperative multi-cell processing techniques for energy-efficient cellular wireless networks,” in E. Hossain, V. K. Bhargava and G. P. Fettweis, Green Radio Communication Networks, Cambridge University Press, 2012. [J18] Q.-T. Vien, T. A. Le, H. X. Nguyen, and T. Le-Ngoc, "A physical layer network coding based modify-and-forward with opportunistic secure cooperative transmission protocol," Mobile Networks and Applications, Oct. 2018. [J17] H. Al-Salihi, M. R. Nakhai, and T. A. Le, "Enhanced sparse Bayesian learning-based channel estimation with optimal pilot design for massive MIMO–OFDM systems", IET Communications, vol. 12, no. 17, pp. 2174-2180, Oct. 2018. [J16] H. Al-Salihi, T. V. Chien, T. A. Le, M. R. Nakhai, "A Successive Optimization Approach to Pilot Design for Multi-Cell Massive MIMO Systems", IEEE Communications Letters, vol. 22, no. 5, pp. 1086-1089, May, 2018. [J15] Z. Chu, T. A. Le, H. X. Nguyen, A. Nallanathan, and M. Karamanoglu, "A Stackelberg-Game Approach for Disaster-Recovery Communications Utilizing Cooperative D2D", IEEE Access, vol. 6, no. 1, pp. 10733-10742, Dec. 2018. [J14] Z. Chu, H. X. Nguyen, T. A. Le, M. Karamanoglu, E. Ever, and A. Yazici, "Secure Wireless Powered and Cooperative Jamming D2D Communications," IEEE Transactions on Green Communications and Networking, vol. 2, no. 1, pp. 1-13, Mar. 2018. [J13] Q.-T. Vien, M. O. Agyeman, T. A. Le, and T. Mak, "On the nanocommunications at THz band in Graphene-enabled wireless network-on-chip," Mathematical Problems in Engineering, 2017, pp. 1-13. [J12] T. A. Le, Q.-T. Vien, H. X. Nguyen, D. W. K. Ng, and R. Schober, "Robust chance-constrained optimization for power-efficient and secure SWIPT systems," IEEE Transactions on Green Communications and Networking, vol. 1, no. 3, pp. 333-346, Sep. 2017. [J11] I. Karim, Q.-T. Vien, T. A. Le, and G. Mapp, "A comparative experimental design and performance analysis of Snort-based intrusion detection system in practical computer networks," Computers, vol. 6, no. 1, pp. 1-15, 2017. [J10] Q.-T. Vien, T. A. Le, B. Barn, and C. Phan, "Optimising Energy Efficiency of NOMA for Wireless Backhaul in Heterogeneous CRAN," IET Communications, vol. 10, no. 18, pp. 2516-2524, Dec. 2016. [J9] S. Nasseri, M. R. Nakhai, and T. A. Le, “Chance Constrained Robust Downlink Beamforming in Multicell Networks,” IEEE Transactions on Mobile Computing, vol. 15, no. 11, pp. 2682-2691, Nov. 2016. [J8] T. A. Le, H. X. Nguyen, Q.-T. Vien, and M. Karamanoglu, “Secure Information Transmission and Power Transfer in Cellular Networks,” IEEE Communications Letters, vol. 19, no. 9, pp. 1532-1535, Jul. 2015. [J7] T. A. Le and K. Navaie, “On the interference tolerance of the primary system in cognitive radio networks,” IEEE Wireless Communications Letters, vol. 4, no. 3, pp. 281-284, Jun. 2015. [J6] T. A. Le and K. Navaie, “Downlink beamforming in underlay cognitive cellular networks,” IEEE Transactions on Communications, vol. 62, no. 7, pp. 2212-2223, Jul. 2014. [J5] T. A. Le and M. R. Nakhai, “Downlink optimization with interference pricing and statistical CSI,” IEEE Transactions on Communications, vol. 61, no. 6, pp. 2339-2349, Jun. 2013. [J4] T. A. Le, S. Nasseri, A. Zarrebin-Esfahani, A. Mills, and M. R. Nakhai, “Power-efficient downlink transmission in multi-cell networks with limited wireless backhaul,” IEEE Wireless Communications Magazine, Special Issue on Technologies for Green Radio Communication Networks, vol. 18, no. 5, pp. 82-88, Oct. 2011. [J3] T. A. Le and M. R. Nakhai, “Throughput analysis of network coding enabled wireless backhauls,” IET Communications, vol. 5, no. 10, pp. 1318-1327, Jul. 2011. [J2] C. Han, T. Harrold, S. Armour, I. Krikidis, S. Videv, P. M. Grant, H. Haas, J. S. Thompson, I. Ku, C.-X. Wang, T. A. Le, M. R. Nakhai, J. Zhang, and L. Hanzo, “Green radio: Radio techniques to enable energy-efficient wireless networks,” IEEE Wireless Communications Magazine, vol. 49, no. 6, pp. 46-54, Jun. 2011. [J1] T. A. Le and M. R. Nakhai, “Possible power-saving gains by dividing a cell into tiers of smaller cells,” IET Electronics Letters, vol. 46, no. 16, pp. 1163-1165, Aug. 2010. [C32] L. V. Hung, I. Ku, A. A. El-Saleh, and T. A. Le, "On the Efficiency of MIMO Transmission with channel state information Feedback," in Proc. IEEE Int. Conf. on Telecommun. (ICT 2019), to appear, pp. 1-5. [C31] A. Omorinoye, Q.-T. Vien, T. A. Le, and P. Shah, "On the Resource Allocation for D2D Underlaying Uplink Cellular Networks," in Proc. IEEE Int. Conf. on telecommun. (ICT 2019), to appear, pp. 1-5. [C30] T. A. Le, T. V. Chien, and M. R. Nakhai, "A Power Efficient Pilot Design for Multi-cell Massive MIMO Systems," in Proc. IEEE Global Conf. on Informa. and Signal Process. (GlobalSIP 2018), Nov., 2018, pp. 1-5. [C29] H. Al-salihi, M. R. Nakhai, and T. A. Le, "DFT-Based Channel Estimation Techniques for Massive MIMO Systems," in Proc. IEEE Int. Conf. Telecommun. (ICT 2018), June, 2018, pp. 1-5. [C28] T. V. Chien, E. Björnson, E. G. Larsson, T. A. Le, "Distributed Power Control in Downlink Cellular Massive MIMO Systems", in Proc. IEEE ITG Workshop on Smart Antennas (WSA 2018), Mar., 2018, pp. 1-7. [C27] Z. Chu, T. A. Le, D. To, and H. X. Nguyen, "Sum Throughput Optimization for Wireless Powered Sensor Networks", in Proc. IEEE Global Telecommun. Conf. (GLOBECOM 2017), Dec., 2017, pp.1-6. [C26] Z. Chu, T. A. Le, H. X. Nguyen, M. Karamanoglu, Z. Zhu, A. Nallanathan, E. Ever, and Adnan Yazici, "Robust Design for MISO SWIPT System with Artificial Noise and Cooperative Jamming", in Proc. IEEE Global Telecommun. Conf. (GLOBECOM 2017), Dec., 2017, pp.1-6. [C25] Z. Chu, T. A. Le, H. X. Nguyen, A. Nallanathan, and M. Karamanoglu, "Robust Sum Secrecy Rate Optimization for MIMO Two-way Full Duplex Systems", in Proc. IEEE 86th Veh. Technol. Conf. (VTC Fall), Sep. 2017, pp. 1-5. [C24] H. Al-salihi, M. R. Nakhai, and T. A. Le, "Enhanced Sparse Bayesian Learning-based Channel Estimation for Massive MIMO-OFDM Systems," in Proc. European Conf. Network Commun. (EuCNC 2017), Jun. 2017, pp. 1-5. [C23] Q.-T. Vien, T. A. Le, C. V. Phan, and M. O. Agyeman, "An Energy-Efficient NOMA for Small Cells in Heterogeneous CRAN Under QoS Constraints," in Proc. European Wireless 2017, May 2017, pp. 1-6. [C22] Z. Chu, H. X. Nguyen, T. A. Le, M. Karamanoglu, D. To, E. Ever, F. M. Al-Tuhman, and A. Yazici, "D2D Cooperative Communications for Disaster Management," in Proc. IEEE Int. Conf. Telecommun. (ICT 2017), May, 2017, pp. 1-5. [C21] Q.-T. Vien, T. A. Le, and T. Q. Duong, "Opportunistic secure transmission for wireless relay networks with Modify-and-Forward protocol", in Proc. IEEE Int. Conf. Commun. (ICC 2017), May. 2017, pp. 1-6. [C20] Z. Chu, H. X. Nguyen, T. A. Le, M. Karamanoglu, D. To, E. Ever, F. M. Al-Tuhman, "Game theory based secure wireless powered D2D communications with cooperative jamming", in Proc. Wireless days 2017, Mar. 2017, pp. 1-4. [C19] Q.-T. Vien, T. A. Le, X.-S. Yang, and T. Q. Duong, "On the handover security key update and residence management in LTE networks", in Proc. IEEE WCNC, Mar. 2017, pp.1-6. [C18] T. A. Le, Q.-T. Vien, H. X. Nguyen, D. W. K. Ng, and R. Schober, "Robust Chance-Constrained Optimization for Power-Efficient and Secure SWIPT", in Proc. IEEE Global Telecommun. Conf. (GLOBECOM 2016), Dec., 2016, pp.1-7. [C17] T. A. Le, K. Navaie, Q.-T. Vien, and H. X. Nguyen, “Beamforming in Coexisting Wireless Systems with Uncertain Channel State Information,” in Proc. IEEE 82nd Veh. Technol. Conf. (VTC Fall), Sep. 2015, pp. 1-5, Invited paper. [C16] Q.-T. Vien, T. A. Le, H. X. Nguyen, and H. Phan, “A Secure Network Coding based Modify-and-Forward Scheme for Cooperative Wireless Relay Networks,” in Proc. IEEE 81st Veh. Technol. Conf. (VTC Spring), May 2015, pp. 1-5. [C15] Q.-T. Vien, T. A. Le, H. X. Nguyen, and M. Karamanoglu, “An Energy-Efficient Resource Allocation for Optimal Downlink Coverage in Heterogeneous Wireless Cellular Networks,” in Proc. IEEE Int. Symp. Wireless Commun. Systems (ISWCS 2015), Aug. 2015, pp. 1-5. [C14] T. A. Le, H. X. Nguyen, Q.-T. Vien, and M. Karamanoglu, “Secure Information Transmission in the Presence of Energy-Harvesting Eavesdroppers in Multi-cell Networks,” in Proc. IEEE Global Telecommun. Conf. (GLOBECOM 2015), Dec., 2015, pp. 1-6. [C13] T. A. Le, M. R. Nakhai, and K. Navaie, “A Robust Transmission Strategy for Multi-cell Interference Networks,” in Proc. IEEE Global Telecommun. Conf. (GLOBECOM 2015), Dec., 2015, pp. 1-6. [C12] Q.-T. Vien, T. A. Le, H. X. Nguyen, and M. Karamanoglu, “An Energy-Efficient Resource Allocation for Optimal Downlink Coverage in Heterogeneous Wireless Cellular Networks,” in Proc. IEEE 12th International Symposium on Wireless Communications Systems (ISWCS), Aug. 2015, pp. 1-5. [C11] T. A. Le, T. Gherkar, M. R. Nakhai and K. Navaie, “Symbol Timing Offset Mitigation in OFDMA-Based CoMP Utilizing Position Aware Transmission," in Proc. IEEE 81st Veh. Technol. Conf. (VTC Spring), May 2015, pp. 1-5. [C10] A. Zarrebin-Esfahani, T. A. Le and M. R. Nakhai, “Robust Cognitive Beamforming for Cell-edge Coverage in Multicell Networks with Probabilistic Constraints,” in Proc. IEEE Global Telecommun. Conf. (GLOBECOM 2013), Dec., 2014, pp. 1-6. [C9] K. Navaie, and T. A. Le, "Fundametal Performance Trade-offs in Coexisting Wireless Networks", IEEE 1st Int. Conf. on 5G for Ubiquitous Connectivity, Nov. 2014, pp. 246-251. [C8] T. A. Le, and K. Navaie, "Downlink Beamforming Design for Cognitive Cellular Systems", in Proc. IEEE WCNC, Apr. 2014, pp. 1199-1204. [C7] A. Zarrebin-Esfahani, T. A. Le and M. R. Nakhai, “Power-Efficient Coverage Scheme for Cell-Edge Users using Cognitive Beamforming,” in Proc. IEEE 24nd International Symposium on PIMRC 2013, Sep. 2013, pp. 3043-3047. [C6] S. Nasseri, T. A. Le and M. R. Nakhai, “Robust and Power Efficient Interference Management in Downlink Multi-cell Networks,” in Proc. IEEE 24nd International Symposium on PIMRC 2013, Sep. 2013, pp. 1102-1106. [C5] T. A. Le and M. R. Nakhai, “A decentralized downlink beamforming algorithm for multi-cell processing,” in Proc. IEEE Global Telecommun. Conf. (GLOBECOM 2012), pp 1-6, Dec. 2012. [C4] T. A. Le and M. R. Nakhai, “Coordinated beamforming using semidefinite programming,” in Proc. IEEE Int. Conf. Commun. (ICC 2012), Jun. 2012, pp. 1-5. [C3] T. A. Le and M. R. Nakhai, “An iterative algorithm for downlink multi-cell beam-forming,” in Proc. IEEE Global Telecommun. Conf. (GLOBECOM 2011), Dec. 2011, pp. 1-6. [C2] T. A. Le and M. R. Nakhai, “User position aware multi-cell beamforming for a distributed antenna system,” in Proc. IEEE 22nd International Symposium on PIMRC, Sep. 2011, pp. 1398-1342. [C1] A. M. Akhtar, O. Holland, T. A. Le, M. R. Nakhai and A. H. Aghvami, “Cooperative Cognitive Radio Beamforming in the Presence of Location Errors,” in Proc. IEEE 73rd Vehicular Technology Conference (VTC Spring), Invited Paper, May 2011, pp. 1-5. [T4] T. A. Le, "D2D solutions for disaster communications: Optimisation Approaches," Middle Eeast Technical University, Ankara, Turkey, Jan. 2019. [T3] T. A. Le, "D2D Communications and Possible Applications to Transportation," University of Transport and Communications, Hanoi, Vietnam, Oct. 2018. [T2] T. A. Le, "A Stackelberg-Game Approach for Disaster Management Utilizing D2D Cooperative Communications," Middle Eeast Technical University, Ankara, Turkey, Sep. 2017. [T1] T. A. Le, "Interference Management and Exploitation in 5G Networks," Queen's University Belfast, Belfast, UK, Sep. 2016. Vien, Quoc-Tuan and Le, Tuan Anh and Phan, Ca V. and Agyeman, Michael Opoku (2017) An energy-efficient NOMA for small cells in heterogeneous CRAN under QoS constraints. In: 23rd European Wireless Conference (EW2017), 17-19 May 2017, Dresden, Germany. 2016-2018: Co-Investigator, Project: "Location-based control and management system for safety warning and emergency rescuing services using LTE D2D technology," Newton Fund/ BC Institutional Links Program, total amount £150K. September 2016: Visiting Scholar at School of Electronics, Electrical Engineering and Computer Science, Queen's University Belfast, UK. 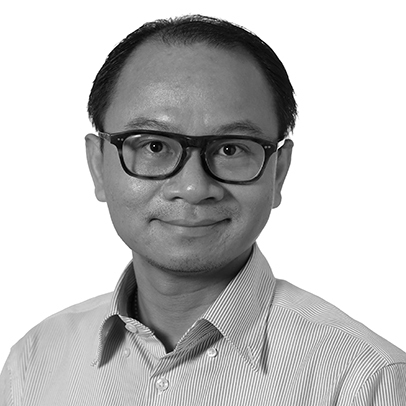 Dr. Tuan Anh Le is a Member of IEEE, IEEE Communications Society and IEEE Signal Processing Society. He regularly reviews papers for IEEE journals and serves as a technical program committee member for flagship IEEE conferences and workshops. He is a Technical Program Chair of the 26th IEEE International Conference on Telecommunications (ICT 2019).